The fun will begin in the classroom with a very informative presentation and then we will move to the driving range. Our morning session concentrates on enhanced head, eyes, clutch and throttle working together for exact bike placement in more technical areas. 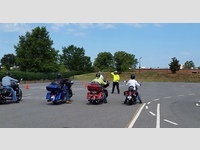 This technique allows you to execute more precision maneuvers with maximum control that will make you safer and impress anyone that sees you drive your bike with purpose. In the afternoon, we'll emphasize braking techniques as we simulate real world scenarios. The next time you have an emergency stop, you'll know exactly how to react and how your motorcycle will respond. Most importantly, you'll know what skills to practice to DRIVE safely when you're under pressure. Afterward we'll take you on the road in real traffic where you'll learn to read the natural road signs you have always seen but never known how to properly interpret and how to handle intense traffic situations.